Another excellent testimonal! "We tried many different coatings after launch in 2011, Zytexx was the only one to deliver what it promised, and we subsequently coated large parts of our hull and... superstructure. We have now used it for 7 years, both over old and new paint and I cannot recommend Zytexx highly enough. -- Neil Riemer, Capt Lady Kathryn V- 13th November 2018"
The New Zytexx brochure is out! Our new brochure is out, with stunning photos of some of our boats and new testimonials from MY Sarafsa and MY Grace E, grab yourself a copy now! Adam Barnett joins the Zytexx sales team in Antibes, France. It is with great pleasure that we introduce our new Technical Sales Rep for France and the Mediterranean, Adam Barnett. Adam has been working in the maritime arena for over 20 years and has a wealth o...f experience of working with captains, senior officers and engineers in the yachting world. Adam is passionate about all things to do with the sea, has sailed for many years and was a regular crew member on the yacht racing scene in the UK. He has personally owned many vessels in his time and currently has a Contest 67 classic 50 year old sailing yacht which he has personally restored to almost factory condition. As a former army officer he is an excellent leader, well disciplined and articulate and we look forward to him representing Zytexx in the many ports and harbours of the Western Med. Published: 19th January, 2018 by Zytexx The clear-coat market has certainly seen a lot of growth since Zytexx was launched ten years ago. Whilst we may have been the first into this market, why are ...we still the number one? We’ve identified some key reasons that we believe have kept us in the top position after so long and thought we’d share! • Our own in-house chemist: re-formulating and continually improving our product, staying ahead of competitors trying to mimic our winning formula. • Our exclusive remover product, meaning that when it’s finally time to re-paint, there’s no sanding required and no damage to the existing paintwork. • Ten years of PROVEN warranty work; we stand behind our products and our applicators. • Tried, Tested and Trusted by hundreds of yachts worldwide – our repeat customers and growing fan club are our best asset and they keep coming back to Zytexx time and again. It’s that simple; Zytexx has the history and has never rested on its (products) laurels. No more proof of this is needed than our latest PG-4400 Hybrid Ceramic Coating (our most advanced ceramic coating to date). Call us to arrange your free test patch and quote now! Published: 19th January, 2018 by Zytexx Super-yachting as an industry is really starting to sit up and take responsibility for itself and making inroads to becoming a greener industry. From hybrid com...pulsion, to on-board water filtration systems (reducing the use of plastic water bottles) we are increasingly aware of our impact on the world and its oceans, which are our livelihood after all. While many interior crews have preferred the use of more natural and less toxic cleaning formulations, this has been slow to move outdoors. A classic deck wash solution has any number of chemicals (sulphates etc) that when used in a wash-down immediately make their way into the ocean and our ecosystem: causing long-term damage to the flora and fauna of the sea. As yachts age, these chemicals often become more and more harsh to counter the wear and tear on the paint due to exhaust smoke, sunblock stains, or watermarks from salt water immersion and ocean pollution. The paint industry has long been regarded an environmental disaster and while many of the harshest of chemicals have now been removed from most paint formulations, the combination of plastic tenting and harsh clean-up chemicals still creates a high ecological toll for any yacht painting. Zytexx takes a lot of pride in our easy application and clean up methods. The fact that our applicators work without masks or protective clothing is testament to this. However in the longer term, how will Zytexx help your Go-Green resolutions? 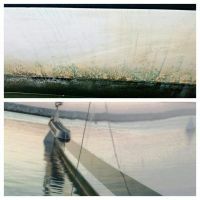 Not only saving valuable man-hours in cleaning effort (thereby assisting with hours of rest regulations during a busy charter), a yacht coated with Zytexx will require no further polishing, and a wash down with a little environmentally friendly detergent will maintain the yacht to the standard the owners have come to expect. Further to this, the glass-like finish of Zytexx along with its outstanding protective qualities will prolong the life of your paint and keep the yacht looking newer longer; thereby postponing the need for costly (financially and ecologically) repaints. So, you want to do your bit this year to make your yacht a green machine? Look at the bigger picture of yacht maintenance, restoration, and protection for the longer term and consider a Zytexx ceramic clear coat. Besides this, your crew will love you for it… Go Green – Go Zytexx! Zytexx USA is now open, based in Rybovich, Florida. Amels 55mtr waterline- see the difference Zytexx makes. Mirror like finish on a recent Amels 52 mtr yacht. Full House at the MYS Annual Zytexx Cocktail party at La Rascasse Bar ! Mangusta 110, Superstructure using PG4200 Hand Application with stunning results! Hand Application 3 micron coating giving these fantastic results on our latest Mangusta 110. At 75 euros per m2 incl prep and application, can you really afford not to this season? Fantastic results with our latest project in Spain. Polished to perfection then covered with Zytexx Hybrid Ceramic ClearCoat with a 2 year Warranty. This is a deckies dream! Simple, quick and easy ...washdowns. Happy Crew. Happy Captain. Happy Guests. Happy Owners. Backed up by 10 years of experience and serice that no one else can offer. To Zytexx or not to Zytexx? When you see pictures like this of before and after Zytexxing, really there is only one choice. 72 mtr superyacht returned to original beauty. The before and after pics say it all for this beautiful 72 mtr superyacht. The NEXT Generation Ceramic Clearcoats. Zytexx Removal Gel PG7100 - NO Sanding required. Our breakthrough Removal Gel PG7100 introduced in 2015 is proving such a hit that even the shipyard paint technicians are now working with the product without a glitch! Zytexx is now easily removed w...ith a simple swipe of a sponge, NO SANDING and leaves the original undamaged paint beneath. Perfect for paint repairs. At Zytexx, we are proud to have genuine testimonials from Super Yachts, with a full PDF from our supporting customers, take their word for it that Ceramic Paint Protection is the future! 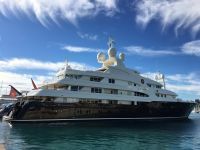 Surf through our current photos to see where we have been and the gloss we have provided to some outstanding super yachts that chose our ceramic paint & glass protection. Frequently asked questions by our ZYTEXX customers for the Ceramic Clear Coat, Ceramic Protective Coating and Glass Protective Coating. Click to find your nearest office to have a Zytexx Ceramic ClearCoat test patch applied to your vessel. We also have a traveling team so don't worry if there's not an office near to you. Contact us today for further information, whether it be technical, a free estimate, to have a text patch applied or to become a distributor for our world class ceramic coatings. Our friendly, knowledgeable staff are always happy to help.